Hacks are defined, lately, as minor conveniences that you can apply to your day-to-day life to make it easier. Remove some of the tedium of reading and smoking hookah while at a hookah lounge or at home with some of our gathered tips that will make you feel like a pro, even if you’re just a beginner. 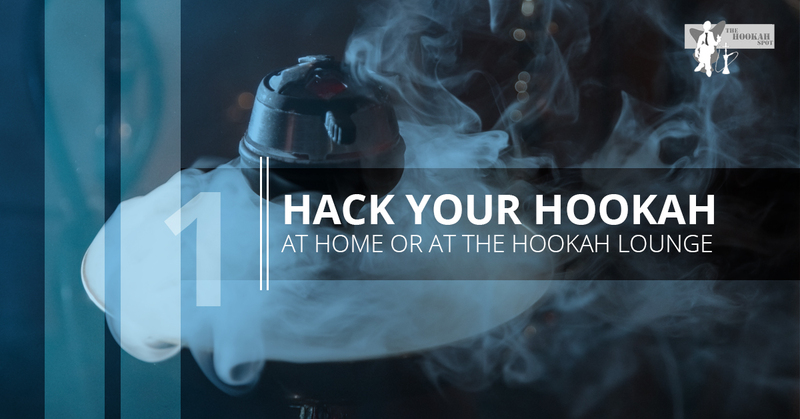 It is our hope that these hacks will help you create a better hookah set up and therefore improve your smoking experience inexpensively. You’ve probably seen this done before if you’ve been smoking for a little bit, as this is one of the most well-known tricks among hookah smokers and hobbyists. If you’re ever missing a hose or a bowl grommet, you can easily turn to the household paper towels as a substitute. Take a piece of paper towel, make it slightly damp and then wrap the paper towel around the mouth of your hose of the stem of the bowl where you’d usually place your grommet. The wet paper can easily create an air-tight seal and you’ll be able to smoke in no time. If you take big breaks between smoking, you might find that your shisha gets dried and old faster than it should. If your shisha is given the chance to deteriorate quickly, it will do so fairly quickly. If you’re a regular hookah smoker, then you have nothing to worry about. But if you’re looking to salvage a baggie of shisha that’s seen some better days, rest easy knowing that it’s not impossible. Take your older, dried out shisha and apply a squeeze of honey or agave nectar to the shisha. This should ensure that you can, at least, get another smoke out of it. When you smoke shisha, the majority of the smoke actually originates from the glycerin or honey that is already in your shisha. That lack of glycerin in dried out or older shisha is what makes it seem bad, or give off thin unsatisfying smoke. Adding a quick shot of glycerin from agave nectar of honey will get rid of that wispy smoke and give your shisha new life. Never struggle to get your hookah going again with your new best friend: the Dust Buster. Don’t huff and puff like the wolf with the three little pigs just to get some smoke going. Start by putting a mouth tip on the hookah hose and then insert the hookah hose into the dust buster, just be sure to have a good hold on it when it starts tugging. Many different hookah lounges have used this as a fast-acting trick when they’re trying to jump-start the hookah that’s meant for your table. The Dust Buster will stoke your coals for a bit, and then your hookah is all set to use. If you’re interested in an unparalleled hookah lounge experience where you won’t need to utilize quick little tricks like this, head on over to Hookah Spot. Our mission is to ensure that you have an amazing experience at out hookah bar that will leave you satisfied and with a new appreciation for the taste and consumption of shisha smoking. Contact us if you have questions about the kind shisha we use and more information.